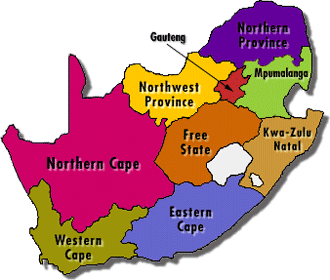 Until recently, this area has seen remarkably little development, despite its attractions: rock of Cederberg-like quality, a great setting, its proximity to Cape Town (this reducing the travel carbon footprint) and a reasonable walk-in distance of about 3 hours. The only real draw-back is that little or no water may be available in the dry season or unless it has rained recently. There remains much scope for climbing new routes of all grades. road, so don’t park in front of the gate. offering shade, green grass and magnificient views of the Chess Pieces. The walk will take anywhere from 2 to 4 hours and is best done early in the morning or late afternoon to avoid the heat. It is advised to carry the water that you’ll need up with you. There is no water here in summer, unless there was a recent big dump. During winter and spring however, abundant water is generally found in a drip at the recess at the bottom of the descent gully. Take along water collection containers. If you can, check current water levels with parties who have recently visited the area. Once topping out on the Chess Pieces, walk down in an easterly direction and then trend leftwards towards a small neck and descend into the gulley that divides the Castle from Smalblaar ridge. Some technical scrambling and three short abseils will see you back at the start. NOTE: Be careful of loose rocks! Duration: about 45 minutes. A large rack is recommended, which includes small and micro wires and micro cams. The route follows a line up the left hand side of the “The Castle,” the grey tower immediately right of Smalblaar ridge. Climb the first pitch of No More Bells up to the big ledge. The route starts off the left hand end of this ledge, just adjacent to the pleasantly cool descent gully. There are two obvious corner systems. “In Your Honour” takes the prominent right hand recess. Start at the base of the right tending grey corner that has a large floating-shield half way up. Pitch 1: 22m, 19. Step up into the layback corner and climb up past a small roof to stance in a scoop below the floating-shield. Note the gear is slim at the stance! into the steepening grove above. Balance over the ramp and then climb the chimney that splits a large block to the ledge above. 2 – It looks possible to traverse left along the ledge back into the descent gulley. Pitch 3: 16m, 21. Step down and rail out right until directly under a peapod groove. Pull up into the groove (exciting) and exit right at the top. Round the corner, move a meter right then crank up on edges to access a small ledge below a roof. Stance Here. allows you access to the steepening corner above. Climb up to stance on a large vegetated ledge. Pitch 5: 40m, 24. NOTE small wires are essential here! Step left off the large ledge and back into the grove. Climb up and then balance left moving into the left of the two corners above. Climb up and left across the blank face and then back right and up under the small triangular roof. Pull over the roof and onto the apron. Hard and thin! Climb up and to the right of a brown water streak/scoop. Below the large roofs traverse left with feet at the level of the brown water scoop. Delicate footwork! Move left to stance on a large ledge, left of the big roofs. NOTE! The water-scoop might be wet after heavy rains! Pitch 6: 20m, 17. This final pitch starts off a block below a layback/water worn groove. Step off the block and climb the rib then the face to the top. FA: Malcolm Gowans & Robert Zipplies; October 2009. Pitch 1: 45m, 15. Climb up from the beacon for 3m then move right up the corner for 2m. Move right onto the white face with the big Cape jugs to a big ledge. Pitch 2: 45m 19. Walk 10m to the left to a beacon. Climb up the obvious crack to the left of a left-facing recess. Halfway up the crack runs out. Then climb the grey face on small holds; this looks blank from below but goes on good, small holds to a ledge. Pitch 3: 25m, 19. Move to the right then up a crack to the top. Step around the corner to a ledge below the overhang. Pitch 4: 45m, 19. Climb up to the base of the roof then move left on flakes to a break through the roof. Once over the roof climb out right to the edge of the buttress. Climb up a thin orange crack to a small stance. Pitch 5: 45m 19. Climb the crack to a jam crack then through a small roof and up a further series of cracks to the top. Pitch 6: (new final pitch): 25m, 20: The route previously ended on the prominent walk-off ledge. A new pitch was added to finish at the summit. This pitch heads up the white face using the slightly overhanging recess with a razor sharp vertical flake. At the first overlap head up left and then with balancy moves head out left to the break in the big roof above. Tricky and serious. FA: (pitch 6): Hilton Davies, Bruce Daniel & Neil Havenga, Nov 2009. Climb the first pitch of No More Bells up to the big ledge. 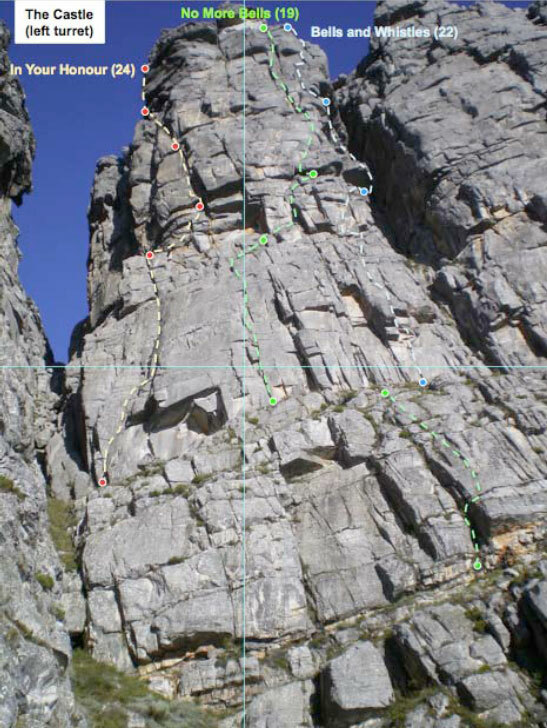 From here the route follows an independent line close to the right edge of the buttress climbed by No More Bells. 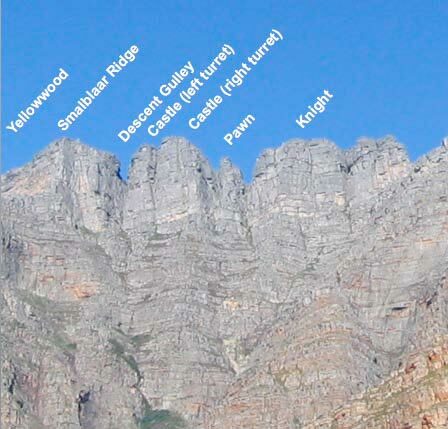 The route starts about 6m to the left of the massive gulley dividing the two faces of the Castle, and 8m below and just right of two square, stepped roofs. Belay in front of a two meter wide detached flake. Pitch 1: 36m, 19. Starting at the cairn, climb the crack leading up to right-hand edge of the two stepped roofs. Break through leftwards (strenuous) using an undercling hold on the right-facing corner in the overhangs and up through the roofs. Continue up the crack, at one point choosing either a left or a right crack up to a semi-hanging stance on a few gargoyles. Stance at the right side of the buttress close to the edge of the gulley just left of a small roof below the middle crack going through the overhanging rock. Pitch 2: 20m, 19. The overhanging crack awaits an ascent. Climb the crack left of the overhanging crack using holds on left, then up and rightwards with some strenuous moves towards the continuation of the right-hand crack (it is possible to step right earlier to an obvious undercling hold, and continue up the crack from there). Continue climbing this through overhanging rock up into easier terrain trending right. Stance on a series of small ledges on the arête. Pitch 3: 20m, 20. Climb the easy cracks facing into the gulley up to the left end of a long narrow roof, where you can break through using jams and/or laybacks (the No More Bells crux on pitch 4 is just around the corner to the left). Continue climbing for a few metres and stance (semi-hanging) 5m higher up close to the arête and about 4m below the next roof. FA: Stephen Davis & Robert Zipplies; March 2010.
burn in the grassy bivvy below. route starts below a small, vegetated left-facing corner. Pitch 1: 35m, 22. Climb up two meters and where it starts getting vegetated, move right, over the arête, onto the slab and via some thin moves up to a downward facing prong. Climb up and slightly left through the break in the roof (crux). Climb the grey face above and into the arching line of weakness then up to a big ledge. Pitch 2: (off the big ledge): 35m, 23. Climb hard layback crack in the left facing corner for about 8m. Pull into the open book below a triangular roof. Climb through right hand side of the roof and further up the crack. Move diagonally left onto a knobbly face and then up to a triangular vegetated ledge. Pitch 3: 25m, 17. From the belay ledge move 2m up and slightly left onto another small ledge. Pull directly up past a small loose flake onto a second ledge in front of some large stacked flakes just left of a left-facing corner. Move right on the ledge and then climb up the flakes moving left toward the top of the upper flake. Traverse left and stance roughly in the middle of the ledge (cairn), below a long narrow roof. juggy break. Tending slightly right, climb up the centre of the grey wall to a left-facing corner and (at about 40m) as that crack closes out traverse out a few metres right up a sloping crack onto a little belay ledge. Pitch 5: 45m, 19. From the small stance climb up leftwards for 3 to 4 meters and up towards a narrow roof. Traverse right to access twin cracks. Climb up these onto the grey face above. Trend leftwards until you reach a big ledge. Climb the face just left of a left-facing corner trending left and then straight up through the open book above. Pull up onto a small ledge and then move higher to stance on a block about 5 meters below the massive rectangular overhang. strenuous squirming to putting Fire-start behind you. FA: Malcolm Gowans & Rob Zipplies; October 2009. Climb any first pitch up to the big ledge. 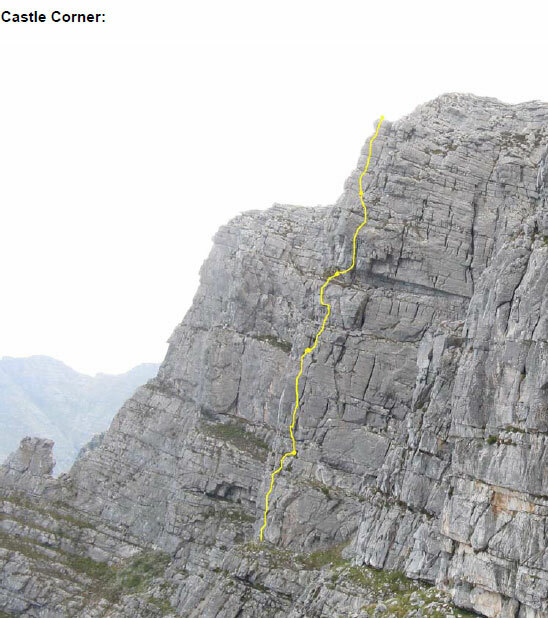 The route starts about 15m to the right of Fire-start’s second pitch up a left-facing orange corner with a beautifully parallel, curved layback crack. Pitch 1: 15m, 22. Climb curved crack (crux moves) up into a small roof topped by a big hollow-sounding flake positioned vertically in the crack. stance on the left about 5 m below a small, narrow roof. Pitch 2: 18m, 19. Climb to the left edge of the roof and traverse out left onto and up rounded holds for about 5 metres (protection sparse but available), before traversing right back onto the face (delicately move around the corner using pockets to place gear). Continue up crack to a sloped ledge on rounded holds. Move 2 metres right and climb up to the bottom left-hand corner of the massive dark grey block clear. Pitch 3: 25m, 16. From belay climb up some bare-looking rock to two good holds, then reach through to a good hold at the bottom of a slightly flaring crack, climb the crack up to a little roof, where one can step out right onto a flake sticking out from the massive grey block. Climb up trending left to about 8 m below the long, narrow roof and then traverse to the far left to belay on top of long loose-looking blocks just below the roof. rightwards to a long thing narrow ledge (sloping down leftwards). Pitch 5: 50m, 18. Roughly in the middle of the long narrow belay ledge climb up a smooth looking face on thin holds and continue up until you a narrow roof. Climb through this roughly in the middle just left of a thin crack which offers good protection, and continue straight up, passing left of a blocky roof near the top. FA: Robert Zipplies, Ian Durbach & Galeo Saintz; January 2010. Start from the grassy ledge below the upper rock band and about 20m left of the big break that divides the Castle into two turrets. Pitch1: 35m, 18. Pull up awkwardly through the left of 2 obvious overhanging cracks. Climb up to the right of the gully then right of the overhangs to a big ledge. Walk right along the big traverse ledge until 20m from the end of this ledge. Pitch2: 45m, 17. Start at cairn immediately right of a large freestanding flake. Step off the flake and pull up on jugs through small overhangs then left to thin crack in a corner. Climb the crack and move 2m left to a stance. Pitch 3: 35m, 14. Climb up rounding the overhang to the left then up the juggy face tending right to stance below a thin crack just to left of the gully. Pitch 4: 45m, 18. Climb 10m up the crack to a hand and foot rail. Move left a couple of metres and then up diagonally left to the break in the overhang. Climb the face above tending right to stance below a scoop. Pitch 5: 10m, 12. Traverse left up through the scoop and walk left to stance below a big crack. Crack-a-long climbs the right face of this crack. Pitch 6: 40m, 14. Climb up the face to the left of the crack diagonally up to the left then back to the edge to round the overhang. Move up and left for about 5m before heading up to stance on the corner below the last tower. Pitch 7: 15m, 13. Climb the corner of the ridge and up wide crack to top. 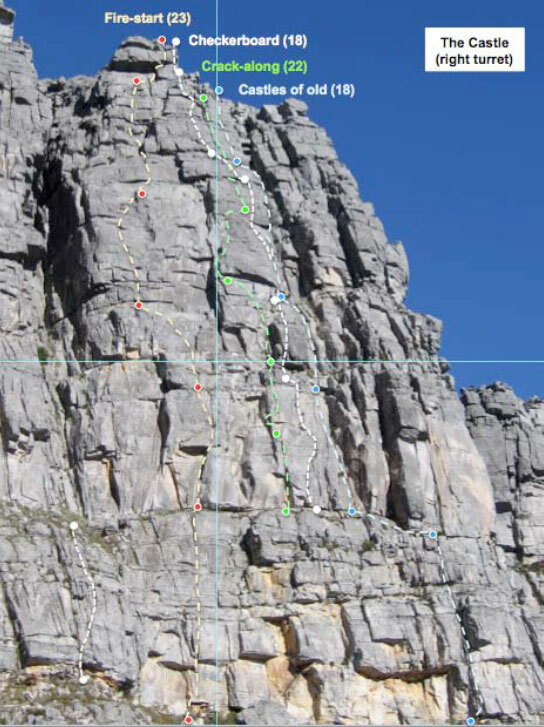 This is a composite route consisting of two or three pitches of a route called The Castle first climbed by Mike Scott and Gabriel Athiros (1966 MCSA journal), and the upper pitches of a route climbed by John Moss and Richard Smithers in about 1967, which was not written up. One or two of the lower pitches are not of the greatest quality, the others are excellent. Walk past start of No More Bells and Fire-start and past two or three massive blocks. The route begins just past the orange wall and overhang, where there is an obvious break in the rock (somewhat chossy). There is a big cairn on top of a big rock. Pitch 1: 40m, 17. Make a difficult step up and around the fins to the right . Climb the somewhat vegetated crack up past a roof on the right. Go round left of small roof higher up. At the next roof stay right. Continue to a big ledge just below a big long black face topped by a square overhang. Belay here. Scramble leftwards for about 20m to the second of the big left-facing corners (about 10m to the right of the Crack-along corner). Pitch 2: 30m, 16. Climb the knobbly face just a few meters left of the left facing corner, trend a little left and straight up, either in the crack on the far right or in a slightly cleaner crack a little more left from the corner. Stanceat obvious ledge. Pitch 3: 30m, 18. Pull through hard overhanging move (crux) and then climb up (some loose-looking blocks) to stance on a small ledge about 3m below the right-hand corner of the long narrow roof. take right crack and up to another blank-looking band of rock (about 3 metres high) which offers no gear. Climb the left-ward trending ramp up onto this band and belay about 5m below a crack in a big gnarly face. Pitch 5: 30m, 14. Climb up the crack and gnarly face to a ledge on big blocks with a cairn. From here scramble up and out. Climbed by Robert Zipplies, Ian Durbach & Galeo Saintz; January 2010. Walk along the bottom of the lower buttress to the right hand corner past some huge blocks. 5m around the corner is a wide crack just before the continuous band of overhangs. This climb remains in the shade for most of the day. Pitch 1: 45m, 16. Climb up just left of Peapod crack. Pull through roof to right. Head up the gully to the right for 15m to a stance underneath an overhanging nose. Pitch 2: 45m, 15. Climb up to the left then move right onto the nose and follow giggle jugs straight up for 45m. Pitch 3: 35m, 18. Climb up to the right onto a scoop. At top of scoop move left delicately for a couple of meters. Move up over rounded bulge on rounded holds to a big ledge. Pitch 4: 45m, 14. Climb the right hand chimney crack and ascend the face above. Pitch 5: 35, 13. Climb the wall just right of ridge. Follow your nose to top. Climbed by Fiona McIntosch, Roy White; 21 March 2010. This chess piece is the second biggest tower to the right from Smalblaar Ridge (see photograph 1966 Journal, p. 41). The tower is split into three portions by small gullies. The route starts roughly in the centre of the middle portion. There is a large beacon marking the start. (1) 90 feet ‘E inf.’: Traverse in from the left along a ledge to a point where there is an obvious break in the bulge. Climb through the bulge and continue up to a handrail. Traverse to the right for 10 feet before climbing to a stance below the overhang. (2) 90 feet ‘E inf.’: Traverse to the right past a chimney to reach the base of an easy recess. Most of the dassie-crawling can be avoided by using footholds on the face below. Climb the recess and then follow an obvious traverse to the left to a small stance. (3) 70 feet ‘E sup.’: Traverse to the left below overhangs to gain a bushy ledge. (4) 30 feet ‘E inf.’: Climb the ramp that slopes up to the right. (5) 90 feet ‘F inf.’: Traverse out to the left, using a jug handle grip on the left-hand side of the small overhang to reach a crack. Climb the face above, pitted with jug grips, moving slightly to the left at the top to gain stance. (6) 100 feet ‘E’: Traverse back to the right to the base of a chimney. Ascend the chimney to a stance (use the exit on the left-hand wall). (7) 90 feet ‘E sup.’: Start up a chimney and traverse out to the right on to the face for 20 feet. Climb up a crack in the face to a stance. A further 15 feet of scrambling to another ledge could be included in this pitch. (8) 60 feet ‘F inf.’: Climb the left-hand wall of a shallow chimney which narrows higher up, and then exit on to the face on the left. Ascend the face, which is cut by a few cracks, to reach the stance. A further 80 feet of scrambling leads to the summit. FA: G. Mosely and A. Killick – 1967. (1) 90 feet ‘E inf.’: Step off some large blocks on to a face and then step out to the left on to a rib. 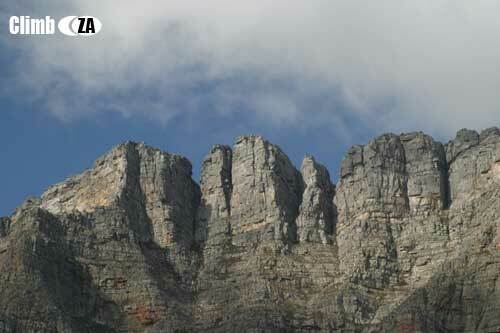 Climb this rib for some way before moving back to the right and continuing up to a ledge. Traverse 30 feet to the left. (2) 50 feet ‘E’: Climb a face with mushroom grips. Move to the right near the top. (3) 40 feet ‘E’: The pitch lies above and slightly to the right. Climb the short undercut face moving to the right to where it culminates in a knife-edge. Climb the knife-edge to a stance. (4) 60 feet ‘D’: Climb up a bushy ramp to a stance at the base of a large chimney. (5) 30 feet ‘E’: Descending slightly, traverse to the left to a small stance beneath a flat face. (6) 50 feet ‘F inf.’: Stepping off a point, move up on small holds for 10 feet. Move to the right into a crack, and then climb a face to the right of the crack. Climb up a knife-edge to a cubbyhole stance. Scramble through a hole in the roof and continue up the face on the right (10 feet ‘D’) to a large ledge. The most prominent feature of the next section of the buttress is a large chimney. Proceed to the base of it. (8) 35 feet ‘D’: Chimney up above the stance, moving to the right into another cleft which leads to a large stance. (9) 100 feet ‘E’: Climb a very broken-up rib. Step out to the left and then continue to climb diagonally to the left across the face. Continue almost straight up to a very large platform. We avoided the top band of rock by climbing a further 100 feet of ‘D’ grade in a recess to the right of the final section. FA: G. Moseley and A. M. Killick. – 1967. Thanks for the hard work putting this together. Lots of fun days to be had out there. Are permits required for this area? If so who do we contact? What time does the cablecar start running? When does the coffee shop open? My bottle of Brave is very small and near empty. Which are the friendly routes? The few routes I’ve done up there are safe, solid for their grade and immensely fun. Roy, Woody and I had a great weekend up there, doing No More Bells and probably a new route on the obvious prominent rib on the far right pillar of the Castle (just left of the righthand skyline). Does anyone know of a line going up there? We found no beacons. BTW the path up is no longer vague, and is very well beaconed from the pylon up.